I'm selling my leftover mugs. Email me at matty@classicgaming.com if you are interested. 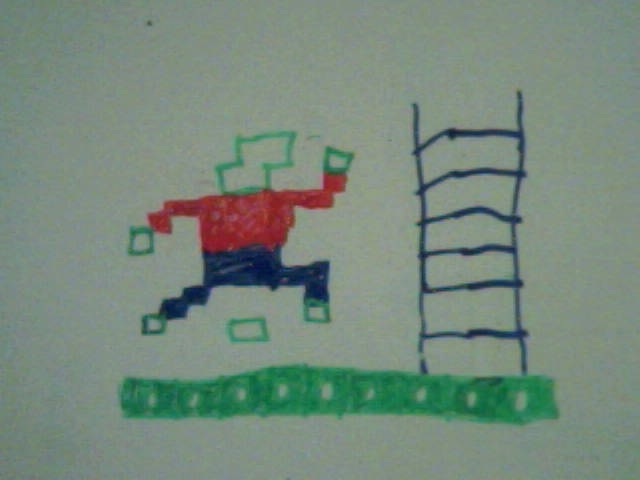 Welcome to a little shrine to Randy Glover's classic game, Jumpman. Click here to play Jumpman on your PC. Click here for a short Jumpman history, following Jumpman's first incarnation in 1983 through all its sequels and prequels, official and unofficial. Click here to check out our repository of Jumpman links and downloadables. Email matty@classicgaming.com with any questions or comments. Enjoy! Scott Miller is the founder and CEO of Apogee/3DRealms. He's worked on every game they've ever released, including the Duke Nukem games and, most recently, Prey. He's also a Jumpman fan and contributed a level to Apogee's 1991 Jumpman game, Jumpman Lives. Scott contributed Level 24, In Big Trouble. Watch this space for updates. Questions, comments, etc to matty@classicgaming.com. IGN, the internet behemoth that hosts this modest shrine to Jumpman, recent added some nifty little software that allows me to see how many visitors this site receives. This software was installed a few months before - finally, inevitably - Wikipedia overtook the Jumpman Lounge as the top Google hit for "Jumpman"... so I have had the slightly depressing feeling of watching the Jumpman Lounge hit count drop rather alarmingly. In meek acceptance, I have rewritten the Wikipedia Jumpman page (here). It was already very complete - I have added a few references, cleaned up the English and corrected a couple of oversights. I also learned something: Jumpman Jr was re-released on the C64 DTV (basically a re-released C64 with several built-in games) in 2003. If there is anyone here who has played it, I'd love to hear a report. Anyway, if you, visitor, have a few minutes, please visit Jumpman on Wikipedia and improve the page I have edited. I'm a Wiki newbie, so I expect I've made a few cultural no-nos (possibly including linking the Jumpman Lounge as a reference source). Another thing I learned today: The Jumpman Project updated to version 1.0.001 back in December, squishing a couple of bugs (including multiplayer support). 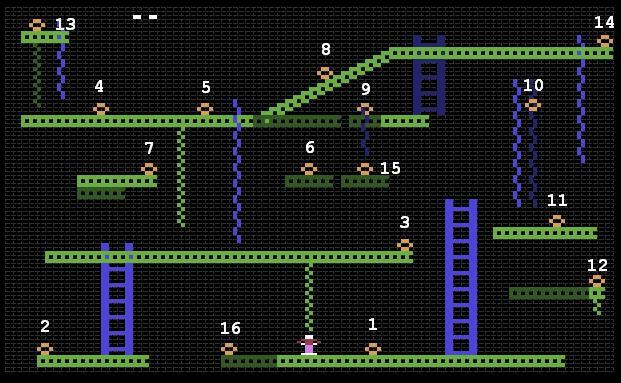 Finally, here's Cobra1's hard-earned perfect Jumpman Junior runs: Levels 5-8 and Levels 9-12. Enjoy. Jumpman creator Randy Glover has a personal webpage up, at the hard-to-find URL of www.randyglover.com. It has quite a bit of nifty background, although Randy - probably aware of his biggest source of internet fame - avoids mentioning Jumpman by name. Hopefully he has no objection to me linking to him from the Jumpman Lounge. If anyone has any links of marginal Jumpman-related interest, please drop me a line (matty@classicgaming.com) & I'd be happy to mention it here. Cobra1 has another impressive Youtube run - Jumpman Lunior Level 1 on Run Speed 1. - Jumpman Beginner, finished on run speed 2 (!) with no lives lost. - Jumpman Junior, levels 1-4. - Figurit & Figurit's Revenge solution, for Jumpman & Jumpman Jr respectively. Cobra1 is having less success with the Intermediate Jumpman levels... anyone think they can manage a perfect run? - Ella has sent 10 levels for Jumpman Lives, which can be downloaded here. - Cobra1 has a solution to his superb (and tough) Figurit 3, which can be viewed here. Those of you who haven't tried Figurit 3 (for Jumpman Under Construction) yet: I highly recommend it. Got some levels to share? Email them to matty@classicgaming.com. Big thanks to reader Mario, who has alerted me to the presence of Hap Hazard, an excellent web-based Jumpman clone. Check it out at www.raptisoft.com. Cobra1 has some more levels for Jumpman Under Construction, which I'm hosting here after the demise of the JUC forums. The first is Danger Zone - which is, quite frankly, better than the original Jumpman levels. The second is brand new - Figurit 3... not surprisingly, a mind-melter in the tradition of the original. Both are hosted over on the Resources page. Sektor has been kind enough to point out that the C64 emulator for the Nintendo DS has now been released. For those with the right hardware, everything you need to know can be found here. The Jumpman Lounge is proud to present The Greatest Work Of Art Ever. Not everyone loves Jumpman. Game Revolution think Jumpman is one of the worst game names of all time. Nothing new to report on the various Jumpman games out there, sadly. There are a few cool Jumpman-related bits and pieces going on though. 3D Realms are revisiting their Apogee past with a very cool series of legacy interviews. They've just added a Dave Sharpless interview. (Dave created Jumpman Lives for DOS, which was released - briefly - in 1991.) The interview is well worth a read. As an aside, Scott Miller - who was the head of Apogee at the time (and still is) - contacted me claiming that the level he contributed to the final game, the much-maligned In Big Trouble, might not be as problematic as we all think it is. Scott informs me that "I can guarantee you that I would never have designed a level where death is a requirement. That goes 100% against my design philosophy." . I asked... and he is yet to get back to me with the solution. My new hero, Sektor, has sent me pictures of Jumpman running on both a Nintendo DS and a PSP. 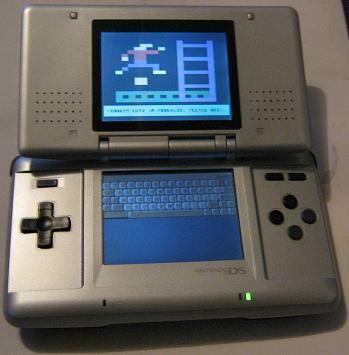 The DS picture is featured above (and will stay there until I receive another Jumpman rig picture - email yours to matty@classicgaming.com, it doesn't have to be anywhere near as impressive as Sektor's). Andrew Doss has created an über-cool Jumpman Zero trailer. Jumpman - Under Construction forums have moved here. Okay, we know that you love playing Jumpman, but how much? Are you still playing Jumpman on your antique Commodore 64? Maybe you're playing it on original Atari or ColecoVision equipment? Perhaps you're playing the TI-99/4A knockoff Junkman Junior on an actual TI-99/4A? Maybe you're on a super-modern PC, but with a special setup dedicated to you C64 emulator (including, of course, Jumpman)? 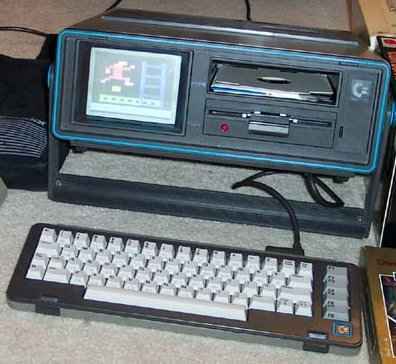 Send your entries to matty@classicgaming.com and please include a word or two about your rig. I'll be posting my little oddity - Jumpman C64 emulated on a Mac laptop with a SNES control pad - soon. Hopefully we can get the ClassicGaming.com lads involved with this too, so send in your pictures and show off your rig to the world. I've managed to turn up a very odd piece of Jumpman paraphenalia - the screenshot you see to your right is from a coarse Jumpman tribute put together by students in the Netherlands. I'm on a Mac nowadays and can't play it, so I'd be interested in hearing from anyone who has. Download it here. If you want to check out the other games put together by students doing the same course, the website is here. Got any Jumpman-related queries or anything we might be interested here at the Jumpman Lounge? Send me an email - matty@classicgaming.com. Manuel, he of the unparalleled Epyx Shrine, is creating a homebrew version of Jumpman for the Atari 2600. 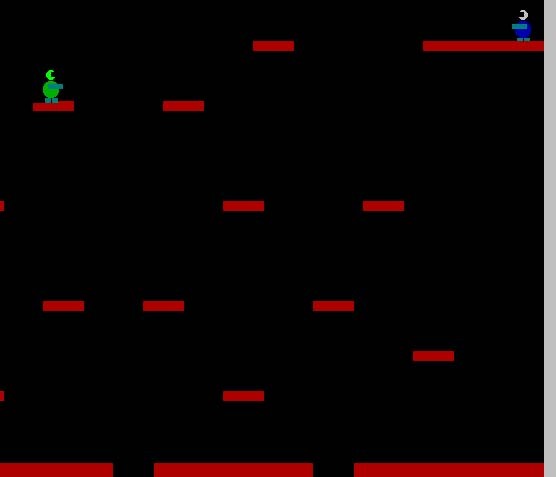 The Atari 2600 is more limited than any of the platforms that Jumpman was originally written for, so he has a difficult job ahead of him trying to pare down the game into something that can run on the 2600 hardware. (I would say inferior 2600 hardware, but I am afraid of being flamed.) He is making regular notes on his progress over at the Atari Age Homebrew Forums. I'm really excited by Jumpman 2600. Five years ago, when this website was still in its infancy, there where no Jumpman games beyond the originals and a handful of extra levels on Jumpman Lives. Since then, I've been able to add eight new Jumpman games the list of sequels in the left-hand column of this page, most of which are playable. That's just awesome. Manuel expects that Jumpman 2600 might be complete sometime in 2006. The good news doesn't stop there. I received an email from a guy named Richard, who had read my interview with the creator of Jumpan Lives, Dave Sharpless. Richard was one of the fortunate souls who bought a full copy of Jumpman Lives from Apogee before it was withdrawn from sale for breaching Epyx's copyright. While the full version of Jumpman Lives is freely available on websites like the Jumpman Lounge, Richard has been able to copy the other goodies that came with game. To activate the cheat mode in Jumpman Lives you must press the TAB key four times (from the main menu screen) and the entire screen will blink. When you start the game you will have several extra men. While playing the game you can press CTRL-BACKSPACE (both keys at the same time) to skip to the next level. You can download a PDF version of the full pamphlet here. Mac users might feel a little neglected in some necks of the woods but not here at the Jumpman Lounge - today's update has not one but two pieces of good news for those with the pretty computers. Firstly, the sunny fellow you see to your right is the logo for Radnor, a graphical front-end for DosBox. Basically, it allows you to run DOS games on a Mac relatively easily - like The Jumpman Project, Jumpman Lives and Classic Jumpman. Get Radnor from its homepage. MacOS X 10.3 or later is required. Secondly, some of you running Jumpman Junior using the shareware Power64 C64 emulator may have noticed a couple of bugs, such as the game freezing when in 2-player mode. This problem can be overcome by switching the emulator to NTSC mode. - Need a refresher on emulators like DosBox or Power64? Try the ClassicGaming Newbie Guide. - Still having problems with Jumpman Junior? Download a hacked version from this webpage. - Need help setting up your Mac, or have anything to add? Email me at matty@classicgaming.com. The second and final part of the interview with Jumpman Lives creator Dave Sharpless is now online. His story in an incredible one and it even has a happy ending. What more could you want? Follow this link to go to the Dave Sharpless interview. 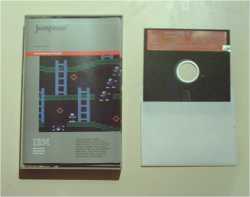 The Jumpman Project is an ongoing effort by Jeff Leyda to port 1983's PC Jumpman (see picture below) to run on today's PCs. Jeff has released a new version which includes VGA graphics and enhanced sound via Soundblaster. He's also moved - leaving the sunny shores of ClassicGaming.com to move to the truly excellent OldSkool.org. The first part of a very interesting interview with Jumpman Lives creator Dave Sharpless is now online. Jumpman Lives was a Jumpman knock-off that was released for the PC in 1991 by Apogee. Epyx, who held the rights to Jumpman, immediately threatened to sue and the game was withdrawn. Dave was a student at the time and had been hired by Apogee specifically to write Jumpman Lives. His story is a fascinating one and well worth a read. Follow this link to go to the Dave Sharpless interview. The interview is split into two parts - the second part will follow soon. Some of you may have noticed that I've changed my background colour slightly (to dark blue), in the hope that my white text is a little easier to read. Let me know - matty@classicgaming.com - if it causes any problems. Most of the site is still in black - I'll eventually change it all over to blue. Hosted by ClassicGaming.com. Last Updated 3 June 2007. Email matty@classicgaming.com with any questions or comments.